3-D images of the arterial wall have been taken with confocal microscopy to see fluorescent marked collagen filaments. 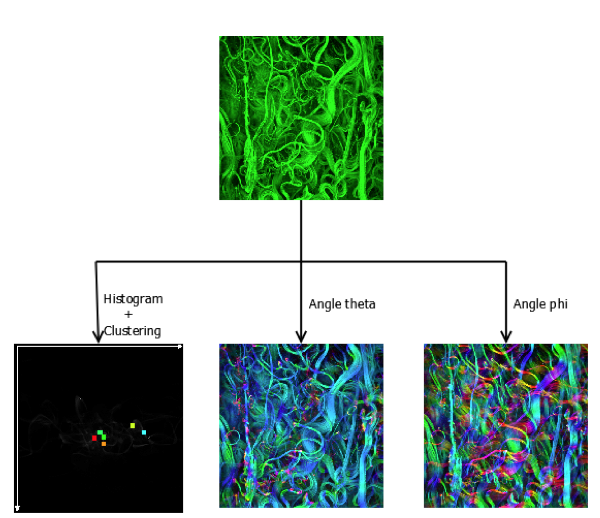 The aim of this work was to implement an ImageJ plugin to automatically detect filaments orientation (i.e. φ and θ), using eigenvectors of the Gradient Structure Tensor. Input parameter σ of Gaussian smoothing allows the user to deal with several filament thicknesses. Then bidimensional histograms were built to represent these angles. On these histograms, a QT-clustering algorithm has been run to see if some preferential orientations occurred. In addition, several colored representations of the original images were made to allow the visualization of these angles.